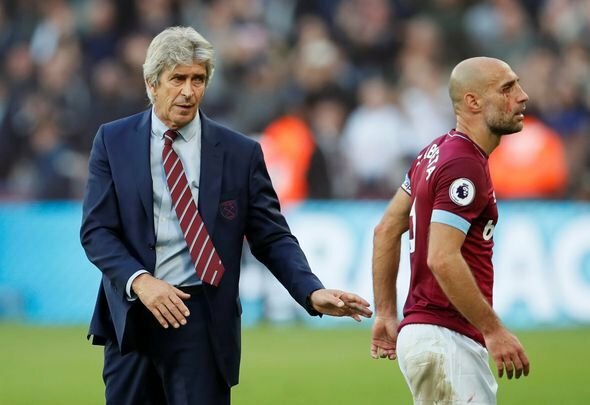 There is no doubting that West Ham defender Pablo Zabaleta brings vital experience and knowledge to the Hammers’ dressing room – which is why he is a trusted general of manager Manuel Pellegrini. With 24 Premier league appearances this season, he has not allowed his age, the former Manchester City star now 34-years-old, to slow down his career in the top flight. However, his regular game time has put the manager in a little bit of a predicament, with Football.London reporting that he is now on the brink of triggering an extension clause in his contract, something which could happen if he plays against Leicester City on Saturday. Zabaleta is very much first choice in east London this season, Ryan Fredericks suffering a bit of a roller-coaster first season at the London Stadium, but that seems unlikely to be the plan after the summer. The full back might not even see his own future at the club, especially if his playing time is to be significantly reduced, and so there have got to be some crunch talks this week to figure out what all parties want to do. If Zabaleta feels an exit would be best for him, he might request that he does not play so as to avoid triggering the clause and leaving on a free transfer this summer. Alternatively, Pellegrini might be planning on getting the defender off the wage bill at the end of the season and so could inform him that he is going to play second fiddle, only featuring in case of emergency. Either way, the situation has a deadline of Saturday – by that point, everyone needs to know what lies ahead.